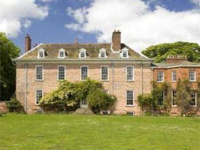 Launched this week in Country Life magazine is the stunning Sheriff Hutton Park, in Yorkshire. This is a quintessential English country estate: grade-I listed house with 10 bedrooms, farm, 200 acres, lake, and parkland. The house, which dates from 1730, is in need of some modernisation but retains many of the original architectural features. So if you have in excess of £5m available this could be the perfect estate for someone who wants the benefits of an important, but manageable house, combined with the opportunity to add your own choice of (architecturally sensitive) interior. This entry was posted in for sale and tagged country house, for sale, grade-i, restoration, sheriff hutton park, yorkshire. Bookmark the permalink.